One of our favorite activities in any trip is trying the local food. And Japan has obviously so much to offer. Beyond the freshest sushi, the yummy tempura, and the sublime box of mochi we brought home, here’s a roundup of our most memorable bites and meals in Tokyo and Kyoto. 10. 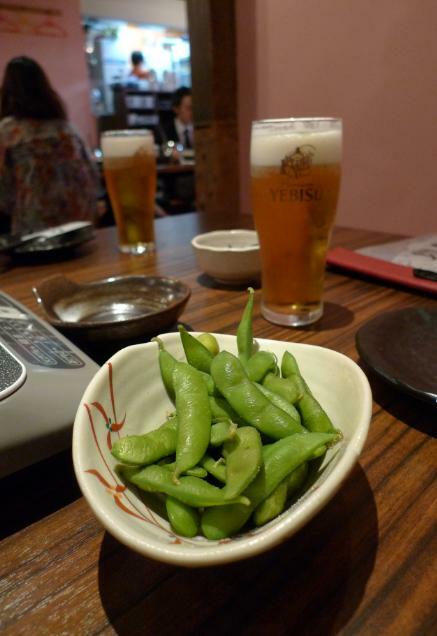 I didn’t think I would like edamame (soybeans harvested at the peak of ripening), but these boiled (sometimes steamed) pods are soft, a little salty, and a really addictive snack with Japanese beer. Kampai! 9. Lawson’s, Family Mart, 7-Eleven—the kobini or convenience stores in Japan abound and in its racks are the dependable (hey, you never know at what street corner you’re going to get hungry) and surprisingly tasty rice balls. 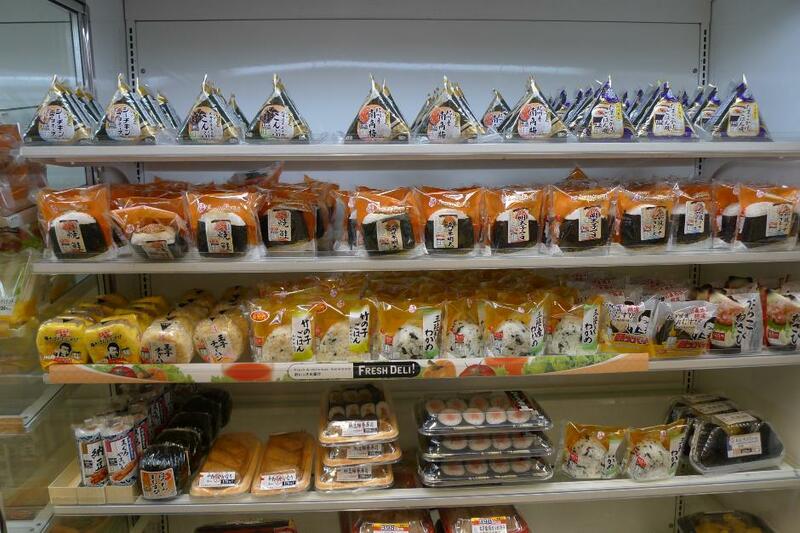 Whenever P and I were in the mood to eat in our room or in the guesthouse, we would buy a stash of konbini goods—the rice balls, rice crackers, sandwiches and all sorts of beverages—and we were happy campers. 8. I first read about them in Kyotofoodie.com, which had me dreaming about them for a couple of months until we made our way to Nishiki Market in Kyoto. These tonyu or soy milk doughnuts (tofu doughnuts at the signboard) are crunchy, chewy, and just with a hint of sweetness. Best eaten when they have just rolled out of the hot oil. I love them to bits. So do a lot of people that there’s often a line to get a bag (starts at ¥250 for 10 pieces). 7. From our first day in Japan, we were pestering our friend C to take us to Yoshinoya, a gyudon-ya chain we were familiar with. He would always shake his head in disapproval. On our third day in Tokyo, right before we headed off to the Anime Fair, he took us to another gyudon (beef bowl) place. “This is better,” he assured us. It turned out to be Matsuya and its beef bowl (referred to as gyumeshi on its menu) was one satisfying meal. The beef and onions had just the right blend of sweet and salty and it was perfect on the bed of fluffy, hot rice. It is served with raw egg, which is typically beaten and mixed with the beef–I passed on that; I was happy putting a generous amount of beni shoga (pickled red ginger) and the red chili mix on my beef bowl. 6. C took us to a number of restaurants he liked around Tokyo. 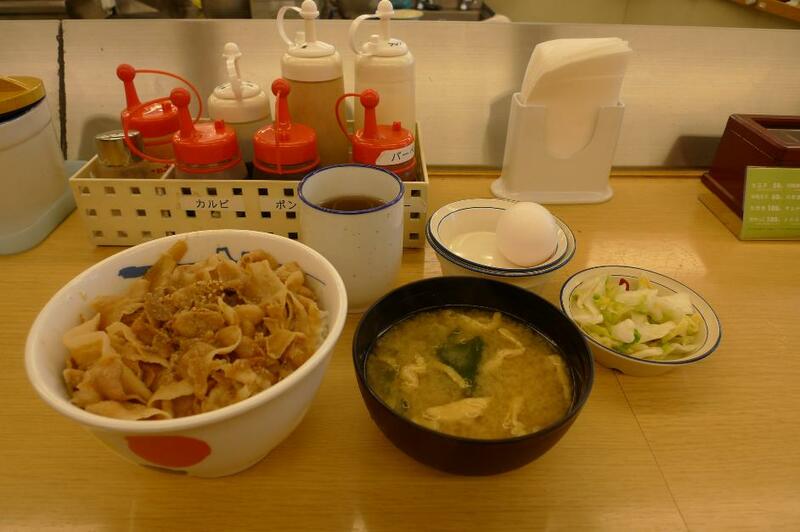 One of which was to Bamboo, a restaurant, within walking distance from the Mori Tower in Roppongi Hills. 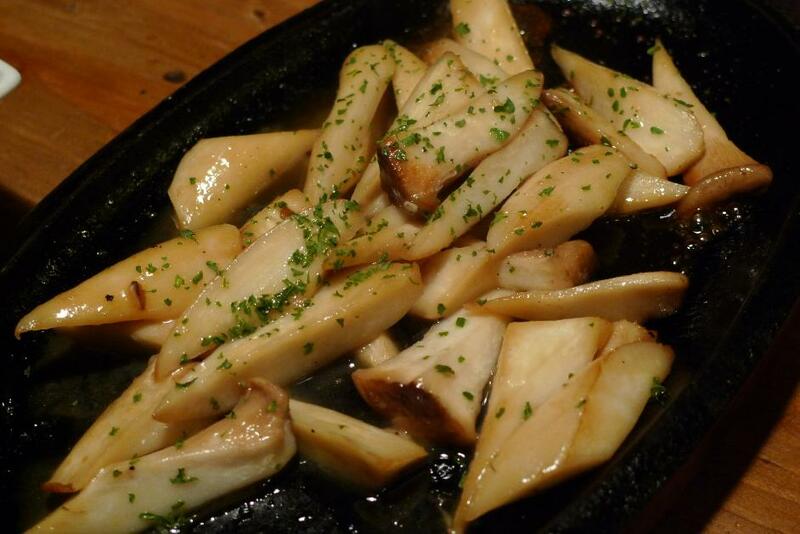 The sizzling plate of sautéed Eringi mushrooms in butter was the highlight of the dinner. Simple, succulent and rich. I know it doesn’t sound so Japanese, but how can you go wrong with butter? We all have it. That place we all dream of going to. Its image tacked on our walls or saved as a seductive screensaver. It is on top of our vacation list, our places-to-see-before-we-die list… we’d sneak it in every list we have if we could. We have never been there, but somehow we’re convinced that simply walking along its streets, tasting its thousands of flavors, or watching everything unfold before us in one of its street corners will be the most divine experience we can have. For me, this place was Japan. I don’t know when my love affair with this country started. 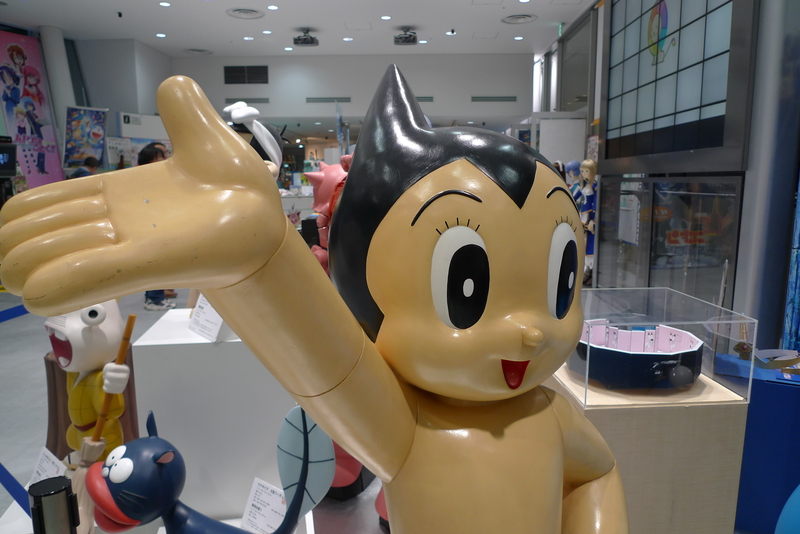 Perhaps it was all those years of watching Voltes-V, Astro-Boy, Shaider or BioMan as a child. Or watching those afternoon documentaries on RPN-9 in the 1980s on Japanese life and culture that appeared either stuck in the past or way ahead of the times. Or finally discovering the sublime Hayao Miyazaki anime? Or maybe it was when I met my husband, whose shared fascination for everything Japanese fed my own wanderlust. Japan was both baffling and beautiful and I knew I had to see it for myself. We also knew that if my husband, P, and I were going to go to Japan, we had to see Tokyo for its sheer size and penchant for the futuristic. 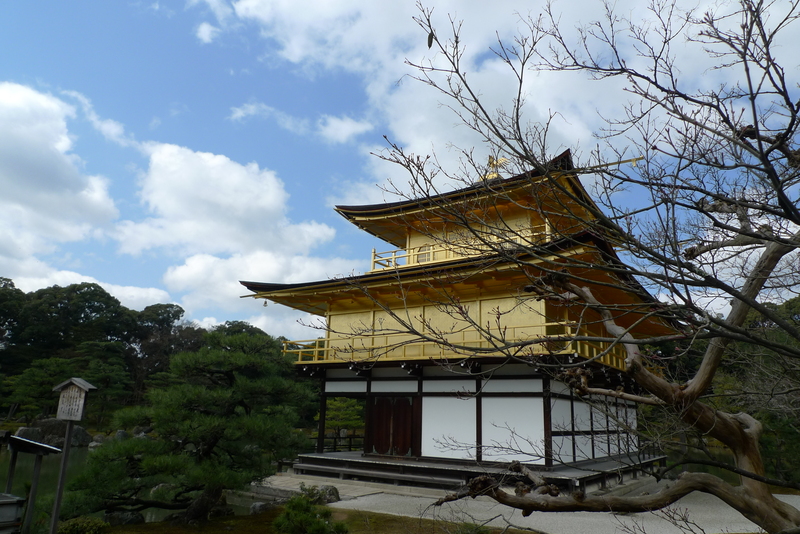 We had to see traditional Japan, which is best seen in Kyoto. And we had to see both against a backdrop of beautiful cherry blossoms. After getting our visas in January, we booked our tickets for end of March to early April, sakura season.